I have been obsess with planner since December 2014 when I was in the hunt for 2015 planner. I suddenly got sucked into planner world and I am loving every minute of it. I was introduced to Erin Condren planner style, Kikki K brand, filofax, kate spade personal size binder, happy planner, midori travelers notebook, hobonichi and many more. The obsession with pens, stickers, color pens and pencils, washi tapes, journal cards were getting out of control. This little world around me feel natural to me because I am a scrapbooker and now I find new ways to use up my stash. After a year of getting my hands dirty and try on most famous planner and not so famous one, I learned a few things a long the way. 1. It can get overwhelmed so easily and so fast in the planner world. You have to do a little bit of research on what kind of planner you want. Decide and stick to it at least for a year. This was totally a new concept to me. I used to look at a planner only as a calendar. Planner is so much more than a calendar. It holds basically your life. Anything that you want to keep track of or anything that's on your mind and anything that you want to make as a priority. So it makes sense to have more than one planner. Different planner holds different things.I am still testing and learning to set up different planner for different area of my life. Decorating your planner and make it pretty is the part where I was totally on board. After trying it out for a few months I realized that I like my weekly layout to be clean and simple. I reduced stickers and washi especially for my work planner. I only go crazy with Erin Condren planner. Know what your style is and don't try to copy other people style. It's okay if your planner don't have any stickers in it. I realised that when it comes to paper planner, writing and decorating in them is so much fun but for reminder I still use digital calendar as a reminder for time sensitive event. At the moment I am comfortable with A5 size planner and Erin Condren planner. I love travellers notebook but I only use it as a notebook at work. Anything that I capture in this I will transfer it to my Kikki K planner.I don't dare to switch to Happy Planner or any other planner. I need to keep my system to a minimum so that I can focus on things that need to be done and not worry about what planner to use. There you have it. If you are new to planner world, my advice to you is listen to your heart and do what's suit you. Don't get discourage if your planner doesn't look as prettty as the other. Get inspiration from the pro and adopt their style to suits yours. Don't feel like you have to have the expensive planner to be productive. 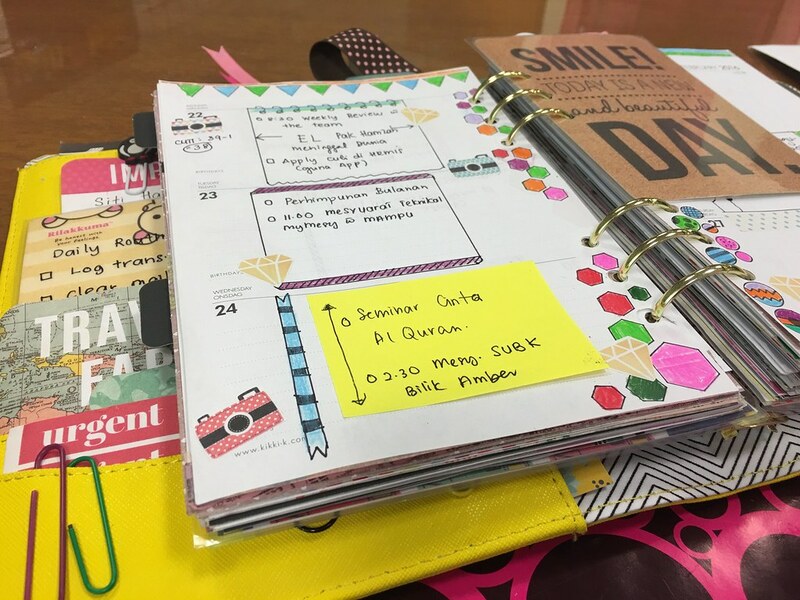 Even the cheapest planner can be made pretty. You have to be able to do things that "spark joy" for you. I hope this little tip will help a bit if you are still new with planner world.